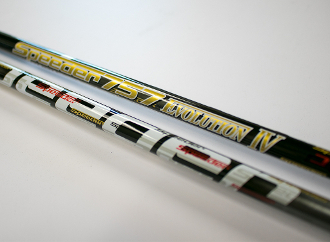 The newest in a long line of Speeders, the Speeder Evolution IV, is developed with the most advanced technologies in the graphite shaft industry. Building on the performance, engineering and material integrations of the Evo II and Evo III, the Evo IV sets the new standard. The IV is based on the profile of the II (low launch and low spin), but has a slightly softer mid to tip section to increase launch angle while maintaining low torque/spin with added high-strength materials. The materials and engineering processes that make up the IV are more advanced than any Speeder that came before. New technologies include a new High-performance intermediate modulus 70-ton material, for lightweight stability and a new “Engineered Outer Bias Technology” that creates smoother loading feel. Technologies that carry over from previous Evolution shafts include MCT (Metal Composite Technology), 90 Ton Carbon Fiber for ultra-lightweight stability and Maximum Carbon Fiber Content (MCFC) pre-preg material.